Viplav has started changing after meeting Dhaani. After his mischief which made Dhaani land in trouble, he quits drinking. His friends ask him to drink wine, and Viplav refuses thinking about Dhaani’s lecture. His friend argues with him asking about his sudden change. Viplav comes to apologize to Dhaani. Dhaani shuts the door and asks him to leave. She says the devil has come again, and asks him to leave. Viplav knocks the door again and asks her to listen to him, else he will break the door. He tells her that he has realized he has put her in big problem and is remorseful. Badi Amma comes and stops Viplav from talking to Dhaani. Later, Dasharath sends a court notice to the widow ashram to get it vacated in 7 days. Dhaani gets the notice and tells all the ashram women about it. Though they have time to leave the place, Tripurari sends some goons to break the ashram belongings. The goons break things of the ashram and pressurize the widows to leave instantly. Dhaani goes to request Dasharath about the court order stay and he does not listen to her. 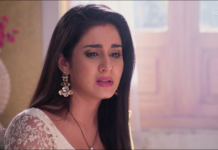 Viplav spots Dhaani crying and leaving. Viplav thinks to help Dhaani and seek her forgiveness for his mistakes. He gets to know the entire story about the court notice and takes a stand for the widows, dismantling all the old customs set by his grandpa Dasharath. How will Dasharath react to Viplav’s rebellious act Keep reading.